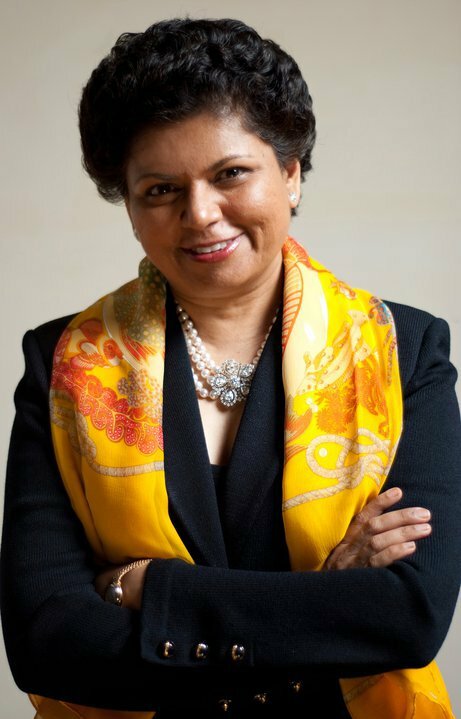 Chandrika Tandon is a business leader, a philanthropist, a humanitarian and a composer and musician. She has been trained by masters in Hindustani, Carnatic, and Western Traditions. Her first album – Soul Call – topped world music charts, garnering great acclaim, and earning her a Grammy nomination. Now joining her past two albums on her own not-for-profit label, Soul Chants Music, her new project Shivoham – The Quest, has just been released. This 3-CD musical spiritual journey brings together a variety of styles, ethnicities and musicians from all backgrounds, resulting in a beautiful work of art that elevates the listener. In addition to being founder and head of her financial advisory firm, Chandrika is a member of the Board of Lincoln Center for the Performing Arts, and the Berklee School of Music’s President’s Council. Additionally, the Berklee Tandon Global Clinics connect world-class music faculty from the US to other countries. At New York University, she is Vice-Chairman of the Board of Trustees, Chair of the President’s Global Council, Chair of the Board of the NYU Tandon School of Engineering, and she serves on the Boards of the NYU Stern School of Business and the NYU Langone Health System. Here we sat down with Chandrika to chat about Shivoham –The Quest. Read the interview below or watch it here! You can also find out more at chandrikatandon.com. WiMN: Share a bit about the concept behind Shivoham – The Quest. CT: This really is a musical expression of a twenty-year journey. I’ve been very active in the business world and I reached a point when I was thinking about what makes me happy. What is success? Why are we here on this planet? All of these meta questions. But they became a sort of strident cry in my head. So 20 years ago I started the journey to explain the answers to those questions. And one of the things that came up was that music was one of the things that made me really happy. I always sang when I was little and this was one of the things that reconnected me back to who I was. And I found that all my happiest moments were tied to music. I went back to studying music. I went back to singing. Back to discovering my own state of love, light, laughter. And this whole 20-year journey has been the quest toward that state. And I call that Shivoham. WiMN: The music on the album is so beautiful. Can you share who you brought together to work on this project? CT: There are about 270 musicians! There were so many genres and so many influences. And so we had a Gregorian chant. And so we wanted to get the best Renaissance instruments for the Gregorian chant. And we brought in some specific Indian instruments that would complement the Gregorian chant. And we used an entire choir at Abbey Road Studios. And then there was another song, because of the criss-crossing of the genres in this album, we brought in the King Singers to sing on a sort of folk-like melody with an old English text which we married with an old Sanskrit verse. And the last piece we brought in the Soweto Gospel Choir, which came in with a sense of jubiliation. It’s a song of blessings. In addition to that we recorded in India with an amazing group of singers and then in New York. We have five choirs on this album and so many soloists. And Kenny Werner on the piano. One of my arrangers was Teese Gohl, who was involved with The Lion King, and Across the Universe and he’s a brilliant musician as well. And many others. WiMN: This is a lengthy piece of work. Tell us about its three movements. CT: That’s the bane of the album in my head. Because we are in this world with 30-second video clips and a song that goes over 3 minutes is too long. And here I am demanding that people take this journey with me on a 90 minute album. But this album is about a journey. There are 12 songs and you can look at it as a song-cycle of sorts. The movements are Yearning, where this voice was inside and it’s asking for something. And I didn’t know what that voice wanted, but I knew what I was doing wasn’t enough. Next was the movement of Searching, and I turned to what I know best. I turned to prayer, I turned to teachers, and books, music and meditation. And the end of that movement is about figuring out that the light is really within you. You have to find and radiate that light within. And the third movement is Connecting. And that sense of connecting is not there forever. It’s like you have a glimpse of it. Like you are wearing these thick, dark colored spectacles for your whole life and for a few minutes you take them off. You see the whole world differently. And even if you put them back on again, you never experience the world the same way. So the three movements reflect that journey. WiMN: I’m so moved by that! CT: And it’s not just our journey, it’s everyone’s journey. Everyone experiences it differently. We spent two years making this album, to bring it together in the best form I could think of. Of course the music is important, but the big dream I have is that this will spark conversation. Because on the planet today what we all need is to find the light within ourselves. How can we radiate peace and harmony and be a connected world of love, light, laughter if we ourselves don’t see that. WiMN: Can you share about the composition process. CT: Yes the music came to me. Almost every song was born during periods of deep meditation. I had fragments of all of the songs, some much more formed than others, over the last ten years. Then I brought Kenny Werner in and I created a structure for the whole album. WiMN: You are such a busy woman…how do you make the space to be creative in your life? CT: With a lot of challenge. But I will say that my practices, which have deepened over the years. You know, my own meditation, breath work. I work to quiet my mind and that has quintupled my energy. So taking away the distractions that stand in the way have diminished. And that’s changed the productive capacity. WiMN: Have you experienced challenges being a woman in business? CT: My whole life has been a challenge. It’s not been easy. I came to this country when I was 23 with $24 in my pocket. I didn’t know anything about anything. And I still make mistakes. But I think as women we have unique challenges which sometimes really get in our way of expressing ourselves. We feel more deeply. There’s a reason they say the divine feminine energy in the planet has got compassion and love and we radiate caring. CT: But there’s a flip side to that. Because having all that means we feel too deeply sometimes. We give so much other people and not enough to ourselves. And that makes us so much more vulnerable to not getting out of the way. There’s a beautiful saying one of my teachers taught me. When you step out of the way, your music comes through. How do you step out of the way? You don’t even know who you are. That is the biggest challenge. This whole journey for me has been that challenge. We are radiant beings. As women we can experience that much more profoundly. But we just need to get out of the way so that we can feel it and be it. CT: I may sound a bit evangelical. But when you experience this transformation for you yourself, you want it for others. You want to share it. WiMN: I understand you’re touring with this. Can you share about what’s coming up? CT: This will have several variations. Initially we’ll have smaller discussions about all of these ideas and the album. In spring of next year we are planning a much broader tour which brings together the music, the visual elements and almost a spiritual experience. And we’ll be doing this together with Berklee College of Music’s Indian Exchange. I’m so excited to bring everyone together. It is not only about the music. There is a call to action here. You start a conversation with yourself as a result of this. The whole album is dedicated to seekers of the light everywhere and the teachers who guide then.